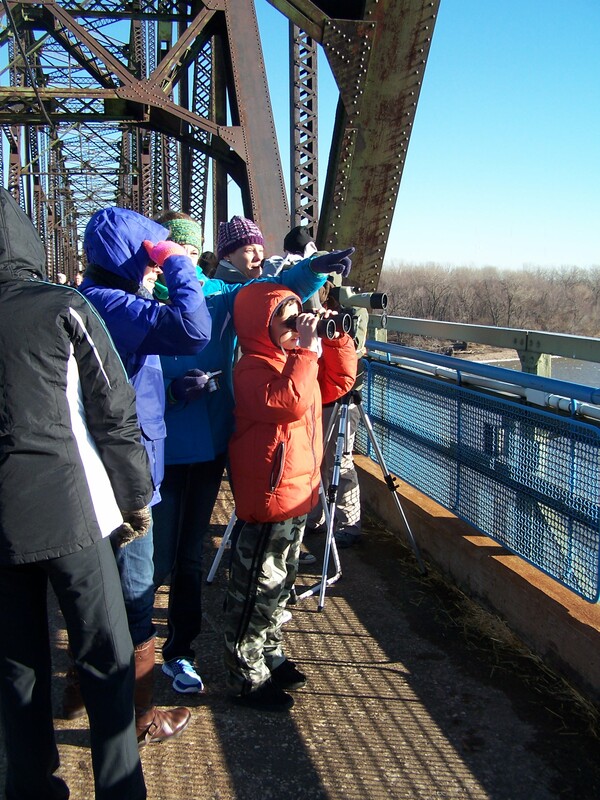 Okay, this was more of a scouting mission than a field trip, but here’s the scoop on eagle watching at the Chain of Rocks Bridge during the annual Eagle Days celebration: basically, if you want to see eagles, wait until it’s really cold outside, cold enough to make the rivers freeze, so that the eagles are forced to small pockets of open water, in this case the chain of rocks in the water that parallels the bridge for easy viewing. Bundle up, pack some hot chocolate in a thermos, bring your own high powered binoculars or spotting scope, come early in the morning and watch the eagles fish. 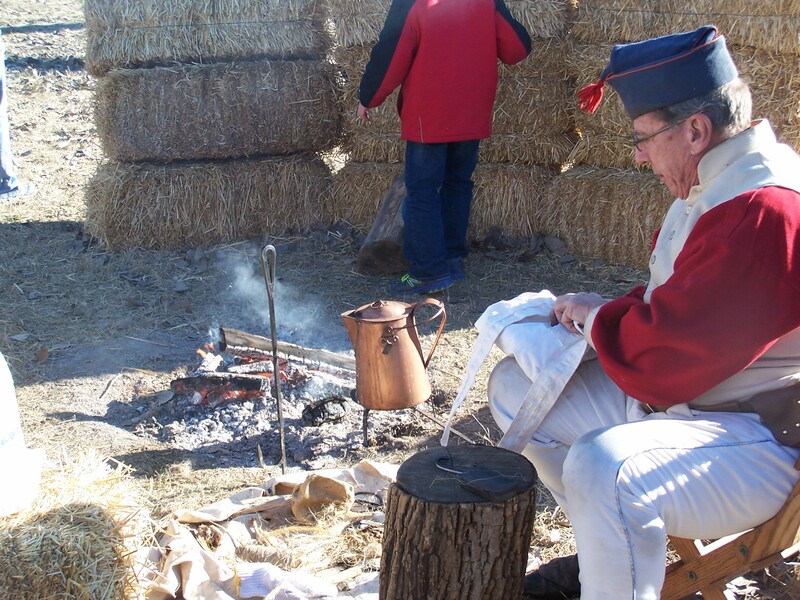 If you want to enjoy Eagle Days, on the other hand, pick a nice warm January afternoon, consider it a pleasant walk in the sunshine, and enjoy the festivities. 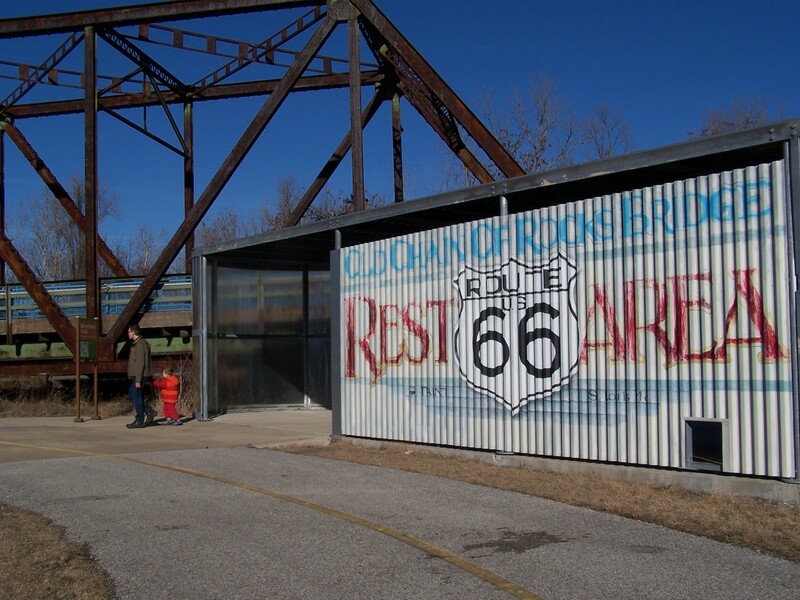 You will see one or two eagles in the far distance, but the fun will be had at the re-enactment camp, at the live eagle tent, and with all the happy people enjoying a cheerful walk along the bridge. 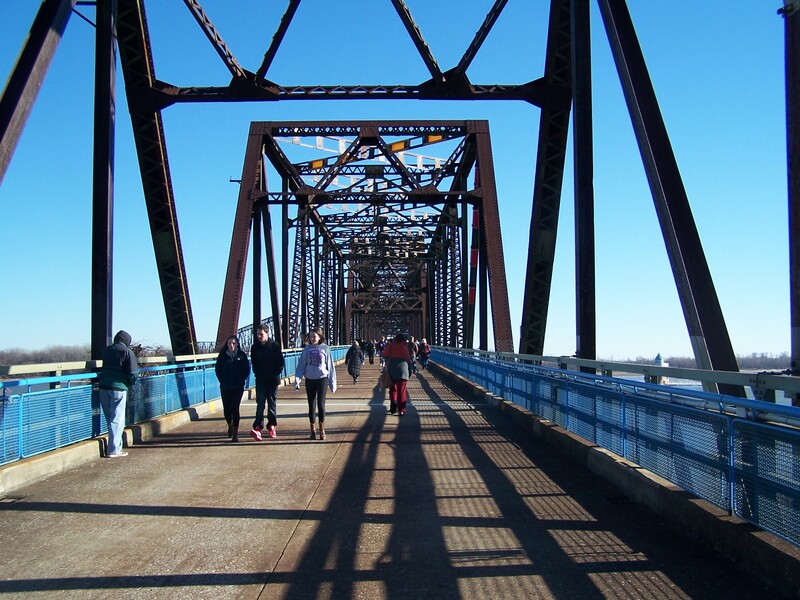 Even if it is a relatively warm day, take care to bundle up, as the bridge is exposed, and the wind chill will get to your bones. Remember, children have smaller body masses and get into thermal trouble very quickly. 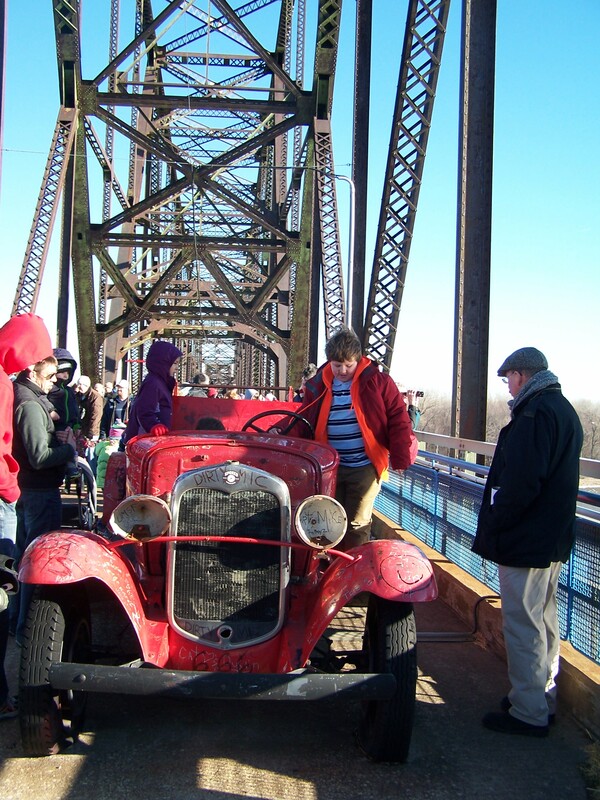 Eagle Days is sponsored by the Missouri Department of Conservation, and happens around MLK weekend each year. It’s growing in popularity, so you can’t count on prime $5 parking. 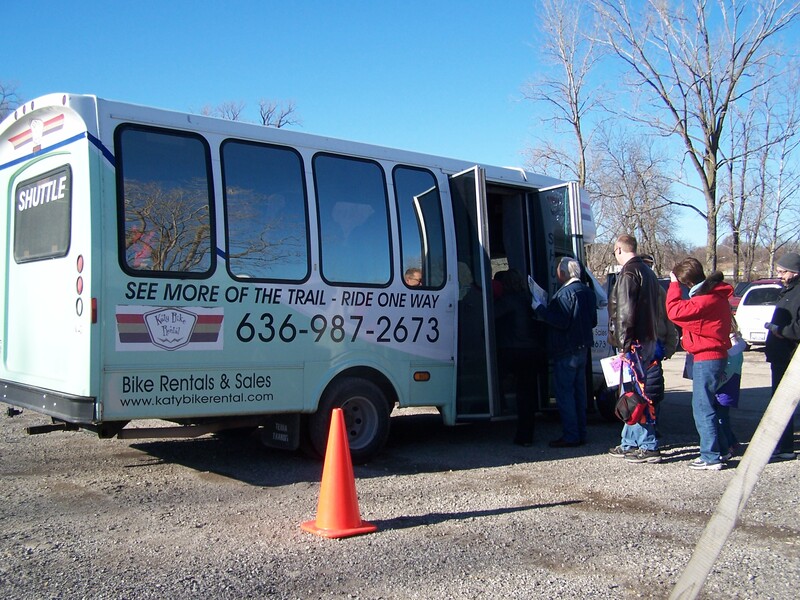 Plan to be funneled into one of the free satellite parking lots, and instead of waiting for the shuttle bus, just start walking along the bike path because you will beat the shuttle bus which sometimes has a 40 minute wait. It’s about a 20 minute walk, which is nothing for a stroller, but probably too far for a toddler or small child. 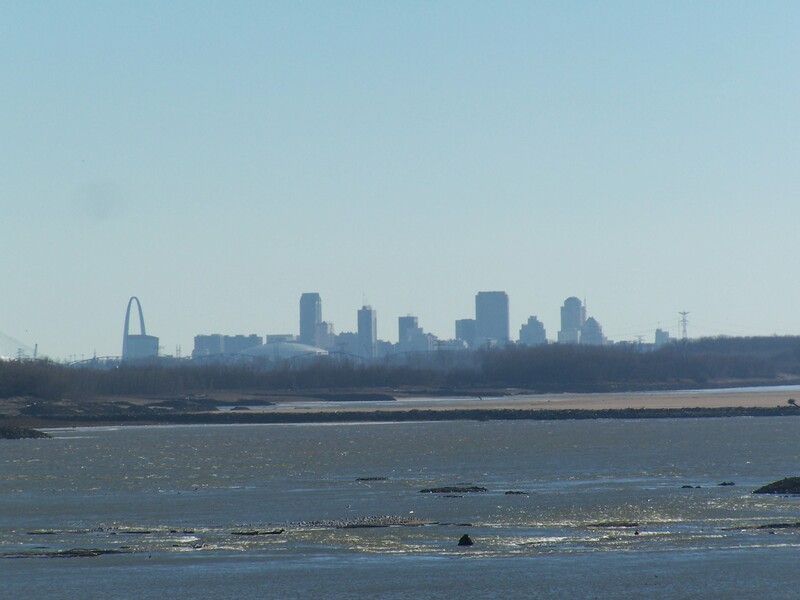 To get to the parking areas from Saint Louis, approach from 270 heading east to Illinois and get off at the last exit (Riverview Drive) before you go over the bridge into Illinois. Turn right after you exit the highway, and the parking lot will quickly appear on your left, very visible and well marked. 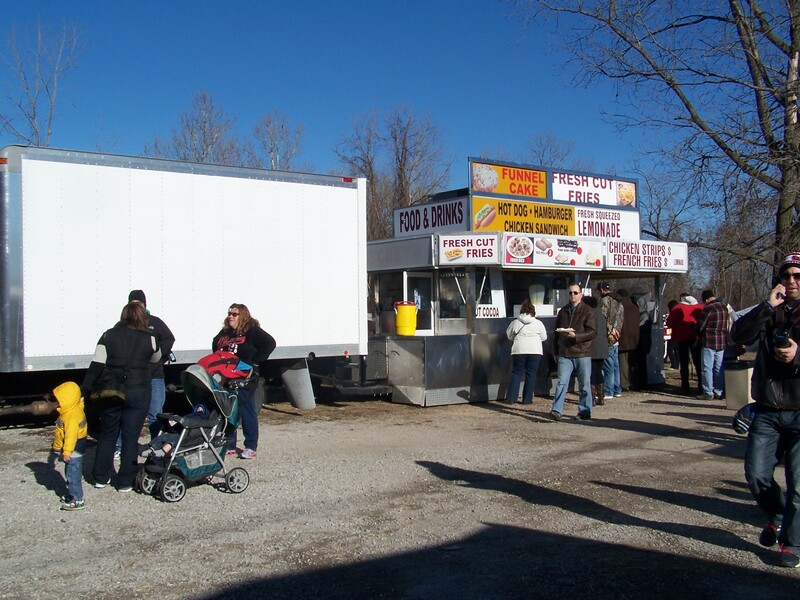 Bring your own snacks, as the food offerings run along the lines of what I would call “carnival food”. Restroom facilities are porta-potty style. The walk will be your major activity, punctuated by chances to peer into the spotting scopes set up by the rangers along the bridge. One lone defunct firetruck served as a popular jungle gym, for obvious reasons. Kids like to climb things. The Lewis and Clark re-enactment camps are always fun and interesting, but there is not much for kids to actually do, really, except look and learn. The giant eagle nest photo opportunity is nice, but even better, encourage kids to construct their own giant “eagle nests” in your own backyard upon return. Obviously, for liability reasons, the MDC can’t have a bunch of kids running around with giant sticks, trying to build eagle nests. Missouri is one of the best spots in the country to view bald eagles, and the story of the returning bald eagle is a positive message that should be purposefully transmitted to future generations. Recall that Rachel Carson, the “grandmother” of the environmental movement, first sent up the alarm about the dangers of DDT in her landmark book “Silent Spring” in 1962. Along with hunting, DDT was responsible for decimating the eagle population, which put eagles on the endangered species list with only 3,000 nesting pairs left in the wild during the 1960/1970s. Since then, due mostly to public pressure and awareness, eagle numbers have grown to over 10,000 nesting pairs in the lower 48 states, and our national symbol is no longer on the endangered species list. It’s important to keep building awareness, and keep bringing kids out to see the eagles. Success stories lend courage to the environmental movement, so share the eagle story freely, (along with closing the ozone hole), because painting a positive vision of the future is our primary responsibility as parents and teachers actively cultivating future stewards of the earth. As a note, I’ve also had good luck watching eagles at Riverlands, or simply by driving along the Great River Road near Grafton, where you can see the spectacular free-fall dance of courtship that eagles do in the air.